The London-based painter invites us into her studio as her debut exhibition opens at Camden's Cob Gallery. Who? Faye Wei Wei is the passionate and precocious British Chinese artist breathing new life into the field of painting. Born in 1994 in south London, she recently graduated from the Slade School of Fine Art, where she finetuned the formal figurative training which underwrites her work with a classically influenced modern symbolism. At school, the majority of Wei Wei’s classrooms had been dominated by boys, she explains, and she found herself criticised for her feminine approach; fortunately, this appraisal only served to drive a bolder and more rigorous ownership of her aesthetic and identity when she reached university. 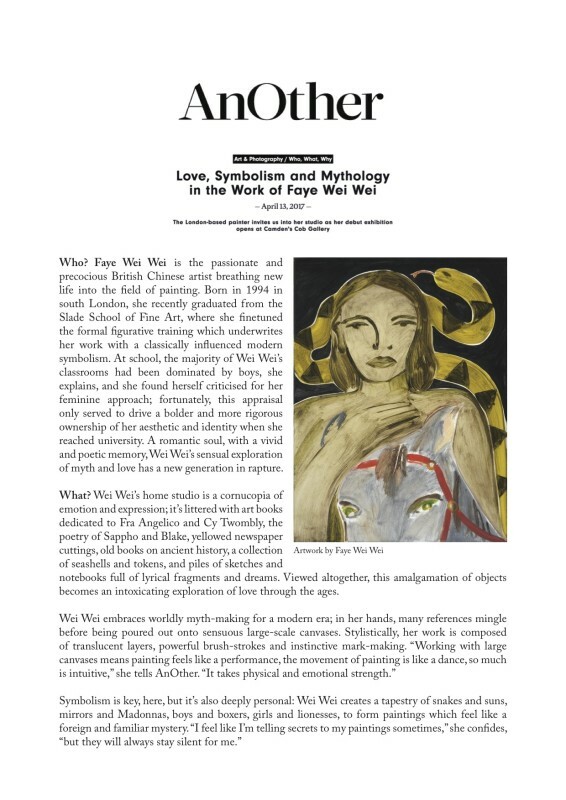 A romantic soul, with a vivid and poetic memory, Wei Wei’s sensual exploration of myth and love has a new generation in rapture.